We're excited to announce our new optional conversion kit for THE SHOOTER 12 that simply bolts on and shoots 15" liner efficiently and easily. So far the contractors who've added it to their inventory have come back with comments like, "that is Amazing!" and "we love it!" and "that's way easier than dragging around a trailer!" The kit comes with the bolt-on funnel assembly, a 15"-12 LIPs, and a 15" hookup nozzle for the liner increasing the range of THE SHOOTER 12 from 4" to 15", all in one very mobile and efficient machine! Give us a call or an email for more information and pricing. Thanks for your interest! THE SHOOTER is mostly known for reliable and fast air inversion with steam cure for quick, efficient pipe relining, but what if you're in a tight easement with difficult access on a job requiring a water installation? Perhaps there's not room for you to get that water tower truck in place but you do have THE SHOOTER and the optional water cure flange. By using air to invert the liner down the MH and just into the host pipe you can then add water for an air/water installation. Continuing with both air and water, the liner will fill and remain inflated as the inversion continues. The layflat is pulled in by the tail during the second half of the shot as with any water install. With the liner inverted and the head pressure sufficient to prevent deflation, remove the top funnel and replace it with the water cure flange (see photo). By using the 4" port on the water flange and one on the back of THE SHOOTER, hot water can be recirculated and the liner cured as normal. The photo shows the curing set up using an original style Shooter. The new ruggedly mobile hand truck with built-in lubrication system and knife gate allows THE SHOOTER to easily get to manholes with difficult access, and the optional water cure flange makes THE SHOOTER an even more versatile asset for underground construction companies. Give us a call at (541) 504-0416, x-6 or stop by our show booth to see THE SHOOTER and accessories in person. We'll be at the WWETT Show booth #6430 in Indianapolis Feb. 22-24, 2018 and the No Dig Show in Palm Springs booth #563 March 26-28. Stop by, we'd love to see you! We're excited to be heading to the Gaylord Resort in Washington, DC for the big NASTT No Dig Show in a couple weeks. Will you be there too? With the combination NASTT and ISTT this year's No Dig will have an international flair and is the biggest trenchless event of 2017. If you haven't yet seen THE SHOOTER in person or if you'd just like to stop by to say hi, we'll be in booth #242. We'd love to see you! What a busy month we've had here at Emagineered Solutions with a furious run of multiple purchases of the new Shooter with lubricating hand truck and knife gate. THE SHOOTER has been flying out of here two at a time in many cases with one company even buying four in less than a year they like it so much. One of the quotes I heard from a contractor who did his research by checking with current users of the new Shooter for their opinion, said he was told that once they bought the new Shooter from Emagineered, the very popular inversion machine they'd been using before has been "just collecting dust." That's the kind of testimony that makes us proud of our product, which we make right here in Redmond, Oregon. We're a small company that takes care in the design and craftsmanship so when we get a sudden rush of Shooter sales that wipes out our inventory, it takes a month or so to build it back up again. We're in that process now, so if you're interested in the best inversion machine out there, give us a call, we can get you formal pricing, but it will be a few more weeks before we'll have any units to ship. That's not a bad problem to have. Thank you for your business and for the great testimonies about how well THE SHOOTER puts liner in the ground and keeps your business competitive! Thank you for visiting our booth at the beautiful Gaylord Texan Resort, site of the NASTT No Dig 2016. We appreciate all of the interest in THE SHOOTER and for all the old friends who've been in this industry for so long stopping by to say hi. Renewing friendships is one of the bonuses of industry trade shows like this one. Again, we thank you. THE SHOOTER always attracts attention, even from those just passing by and who don't have much experience in the relining business. "I'm not sure what it does, but I just like the looks of it," I've heard repeatedly at various shows. And yes, it's a good looking machine but that's not what actually sells the contractor needing a solid machine for his trenchless work. It has to have form and function. And that's precisely what THE SHOOTER does; it simply and efficiently puts pipe liner in the ground. It's a simple machine without a lot of moving parts prone to failure and replacement. It's solidly built for years of hard commercial use. It's now more ruggedly mobile and has user friendly functions like onboard automatic lubrication and a knife gate to prevent air loss at the halfway point of the install. It's well thought out. These are observations from both the passer by and the seasoned SHOOTER user. If you have a need for the best machine for sewer rehabilitation with two models to choose from for pipe 6" to 24", give us a call today. We'd love to talk with you about how THE SHOOTER can help your trenchless contracting business be more efficient and more profitable. The NASTT annual No Dig Show is upon us and we are excited to be heading to Dallas and the beautiful Gaylord Texan! Emagineered Solutions will again be exhibiting THE SHOOTER 12 with built-in lubrication system, knife gate, and ruggedly mobile hand truck that really is the best machine of its kind. Come see us at Booth #220 and ask about our special Show Price. Steve Waring, our founder and CEO will be there as well, bringing his many years of experience in the relining business. Steve was president of NASSCO back in 1991 and invented the first continuous air-inversion machine for cured in place pipe, THE SHOOTER! Stop by the booth. We'd love to meet you! Wow, what a great show in Indy! Thank you everyone for stopping by the booth! It was great to catch up with friends and to meet so many we've only had prior phone and email conversations with, as well as to introduce THE SHOOTER to newly interested contractors, many of whom came specifically to stop by our booth for a firsthand look, including from England, South Africa, Australia, Italy, and Columbia. And thank you for all the testimonials from SHOOTER contractors who repeatedly said THE SHOOTER is the best inversion machine on the market, and that from guys who have used both our machine and various ones from the competition. Your referrals mean so much to us! There's really nothing better than word of mouth advertising. Thank you! A common observation from many walking around the show is that our machine is simple, not complicated like some others, and built like it's made to last. That it is. We have contractors staying busy with THE SHOOTER for sewer rehabilitation using machines that are over fifteen years old and still going strong. We definitely take pride in our workmanship and the fact that we're a small and local, made in America company. Again, our thanks to you. What a great show! 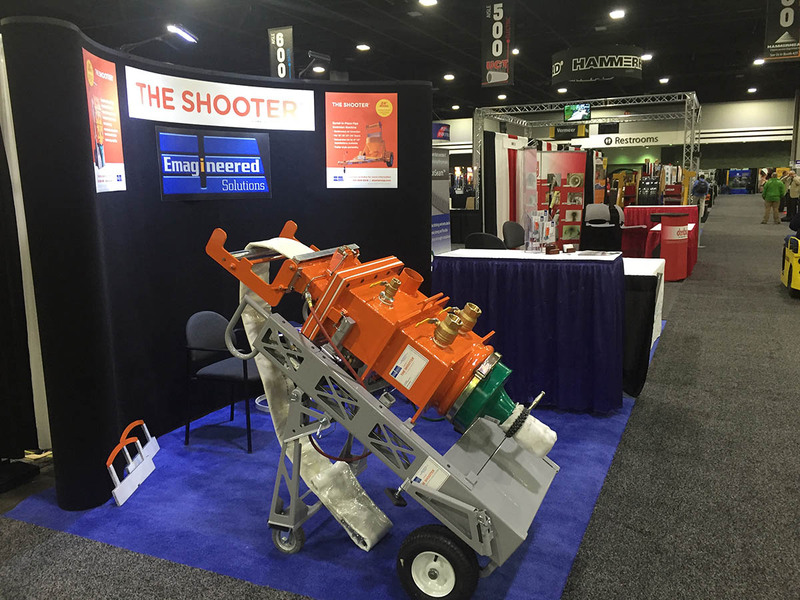 The UCT Show in Atlanta was great, especially the first day when we had many visitors to the booth excited about THE SHOOTER. We especially want to thank Team IPR who repeatedly came by both days with happy testimonials after the last five months using their two new SHOOTERS. Reliable, no hassle, continuous lining is our trademark and that has been their experience. Smiles all around. Thank you IPR! It was also great to meet the other contractors using THE SHOOTER and plenty of new folks who hope to purchase one in the near future. We'll be heading off to Indianapolis next week for the WWETT Show (formerly the Pumper Show). If you didn't get a chance in Atlanta to see THE SHOOTER, or to discuss how Emagineered Solutions can help with your company's CIPP and sewer rehabilitation program, please stop by and see us in Indy, WWETT booth #6304. We'll be in Atlanta next week for the Underground Construction Technology Show! Our booth has been changed. We're now located in Booth #443 near the Food Court and the Rehab Zone. We'll have a new THE SHOOTER 12" on display in the booth. Come on by and see what all the excitement's about! Happy New Year! We're excited to be heading to Atlanta in just a few weeks for the Underground Construction Technology International Conference and Exhibition. Emagineered Solutions will have THE SHOOTER® 12 on display along with other materials in Booth #351. Come on by for a firsthand look at the exciting new design of the favorite SHOOTER®, now with knife gate, onboard lubrication system, and ruggedly mobile hand truck perfect for tight easements and backyards. Come on by Booth #351. We'd love to meet you! Check your email for an announcement regarding our end of the year customer appreciation sale! Everyone who purchased LIPs seals or THE SHOOTER® this year should have received the mailer with the discount options. If you for some reason didn't receive the announcement or would like to be included in the sale, please sign up on the "contact us" page. We truly thank you for your loyal business and hope that 2015 was a good year for your cipp projects. If you are in the market for upgrading to the new model of THE SHOOTER® or need to add to your fleet because of increased business, give us a call at 541-504-0416 for more information. And thank you again for your continued loyalty. THE SHOOTER®, by Emagineered Solutions is the original continuous inversion machine for CIPP, now with a ruggedly mobile self-lubricating hand truck and anti-deflation knife gate. 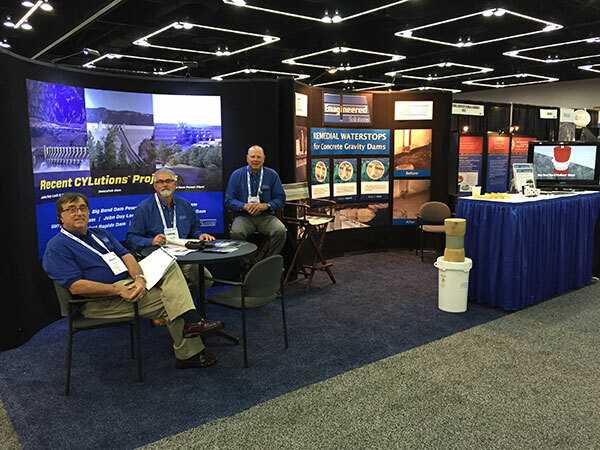 Thank you to all who stopped by the Emagineered Solutions booth at the recent HydroVision Trade Show in Portland. HydroVision 2015 was a good show for us with many engineers, contractors, professors, and dam owners stopping by to visit and learn about how incredible this cutting edge technology can be. Our samples revealed just how much the CYLutions™ expands when in contact with water, and when constrained in a socket drilled on the joint from the deck of the dam, increases uniformly exerting pressures of 350 to 425 psi depending on water temperature. In addition to the cylinder samples, we also had some CYLutions™ crumbles which are used with great success in filling voids in the concrete within the joint socket, and like the full cylinders, are slightly heavier than water and will slowly sink before expanding. Several current and past users of our remedial waterstop and crumbles products also came by the booth to let us know how much they like CYLutions™ and gave strong recommendations future projects. It's always good to hear how well dam engineers and operators feel about our remedial waterstop solution. It’s perfect for repairing leaking monolith joints and navigation locks, as well as installing in new construction. Thanks for stopping by! Abstract from Excessive Water Leakage into Wanapum Dam Controlled by New Generation Waterstop Technology, by Jonathan Blake et al, 2011. Excessive water leakage into Wanapum Dam through failed waterstops led to the installation of a remedial waterstop system. During the winter months leakage into the dam increases and in the past has overwhelmed the plant’s drainage system. On one occasion it was responsible for catastrophic failure of a generator’s isolated-phase bus when it faulted to ground. In 2010 Grant County Public Utilities District contracted with Emagineered Solutions to install a remedial waterstop system using expanding hydrophilic cylinders. This method was chosen over other options due to its ability to be flexible within the joint. The installation involved drilling a 6” hole bisecting the contraction joint through the dam and installing hydrophilic cylinders. Water flow rates were measured from this joint prior to and after the installation. The remedial waterstop system completely eliminated the previous leakage within eight weeks of installation. Since this time two additional installations were completed in August of 2011. Results from these installations have also been effective in eliminating the water leakage. We’re excited to be heading to Portland in July for the HydroVision International Conference and Trade Show. This is an event you don’t want to miss, and if you do attend please visit the Emagineered Solutions® booth #8070 for a firsthand look at our patented CYLutions™, the best available monolith joint waterstop for concrete gravity dams and navigation locks. CYLutions™ remains flexible tolerating movement of the dam unlike some other methods of leak remediation, and can withstand endless wet and dry cycles without affecting performance. The longevity of our waterstop provides lasting value and peace of mind. Stop by our booth #8070. We’d love to talk with you more about how to use CYLutions™ for both leak remediation as well as in new construction. See you there! Emagineered Solutions® proudly unveiled our new design of THE SHOOTER® in Denver this past March. Did you get a chance to see it in person? Many of our longtime users of the original machine recognized our “Oregon State Orange” Shooter and came right over to the booth, immediately remarking about the new lubricating top funnel and radically different cart design. It really does look different, but is still built to last and take the abuse of jobsite environments while reliably inverting liners, just like the models they’ve used for years. And with the new lubrication system, anti-deflation knife gate, and sturdy but maneuverable hand truck, more than a few guys were bringing back their supervisors looking for approval to get one. Were you at the USSD Conference in Louisville back in April? Perhaps you visited the Emagineered Solutions® booth and discovered our monolith waterstop for the first time. We had more than a few visitors who never realized there was such an answer to the problem of failing and leaking waterstops whether they’re made of cast-in-place copper or pvc, and of the various methods of remediation, none are as effective and flexible as CYLutions™. After seeing our presentation video complete with before and after documentation, it became quite clear to many that our CYLutions™ product really works and does so quite well. We also had both hydrated and unhydrated samples to show the incredible expansion of our waterstop cylinders, which when contained in a socket drilled from the easily accessible dam surface, provide a head pressure more than sufficient to greatly reduce and in many cases completely stop joint leakage. If leaking joints in concrete gravity dams and locks is a safety and facility longevity concern, then contact us for more information. We’d be more than happy to provide a list of successful waterstop remediation projects and talk with you in more detail. Emagineered Solutions® has completed the installation of a waterstop system at the 1,038-MW Wanapum hydroelectric plant on the Columbia River in Washington. Emagineered Solutions®, Project manager, Ross Huckfeldt installs CYLution™ cylinders in the Wanapum Dam. The product expands when it comes in contact with water creating an effective waterstop. The CYLutions three step process explained. The CYLutions™ three step process explained. Review of CYLutions™ by Jim Hinds, P.E. and Steve Tatro P.E., Formerly U.S. Army Corps of Engineers. THE SHOOTER®, our trenchless, cured-in-place pipe relining unit, is deployed to repair sewer lines for a U.S. municipality. Copyright ©TEXT Emagineered Solutions, Inc. All rights reserved. CYLutions™ and THE SHOOTER® are registered trademarks of Emagineered Solutions, Inc. THE SHOOTER: US Patent Nos. 6,390,795 6,960,313 9,851,041 and others. Waterstop/CYLutions: US Patent Nos. 4626133 and 4655638.